Week 4 is in the books and once again fantasy owners are scrambling after a plague of injuries hit the NFL. This week was a bad week for rookies, where Chris Carson and Dalvin Cook left with season ending leg injuries. Here are some waiver wire gems to consider going into Week 5. 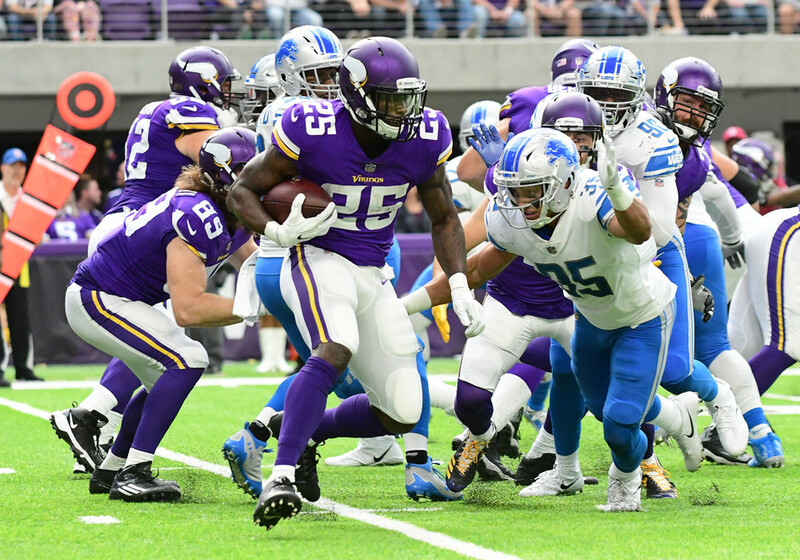 Latavius Murray hasn’t seen the field much since coming to Minnesota, but has been given a big opportunity with the loss of Dalvin Cook. Murray has struggled in recent years, looking slow behind a great offensive line at Oakland. It was enough for Oakland to let Murray walk last season. In Week 4 against the Lions, Murray rushed 7 times for 21 yards and added 2 catches for 8 yards. The talent might be lower than Cook, but he has the opportunity for some big volume, although it comes behind an iffy offensive line. Murray should be added in all leagues based off volume. Eddie Lacy and Thomas Rawls have taken turns being inactive, but with the injury to Chris Carson, they look to be co-starters once again. Lacy, who was the one active in Week 4, got 11 carries for 52 yards against the Colts. Rawls has been wildly ineffective so far this year (5 rushes for 4 yards), but Coach Pete Carroll hinted at Rawls being the starter anyway. Rawls should be added in all leagues, and Lacy can be added in deeper leagues until we know how this will play out. Another rookie, Wayne Gallman stepped in for an injured Paul Perkins in Week 4. Gallman rushed 11 times for 42 yards and caught 2 passes for 8 yards and 1 touchdown. Gallman looked better than Perkins has, and should get a shot on an 0-4 Giants team that really has nothing to lose. Gallman should be added in 10 team leagues. Aaron Jones came into the season as the 3rd running back behind Ty Montgomery and Jamaal Williams. Within 2 quarters he was the Green Bay starting running back. He turned the opportunity into 49 yards on 13 rushes and added a touchdown. Jones had looked explosive all pre-season, and has a chance to shine until Montgomery returns from a rib injury. Seeing as how Montgomery will get the starting role back when he returns, Jones is more of a 1-2 week fill in for fantasy teams who desperately need a running back. He should be added in 10 team leagues, but top waiver priority shouldn’t be wasted unless necessary. Alex Collins was again the highlight of the day for Baltimore, actually starting at running back in Week 4 over Terrance West and Buck Allen. Collins rushed 9 times for 82 yards; however he did lose a fumble in the first half. Still, Collins looked to have the most effective running back, and is continuing to push for more carries. He should be added in 12 team leagues, but with how bad the Baltimore offense is, he may not be playable against tough defenses that will stack the box. As mentioned last week, Ezekiel Elliott will have his hearing October 2nd, meaning the court could rule against him and the NFL could start his ban immediately. Darren McFadden should be added as a potential lottery ticket, since he would most likely take over the 1st and 2nd down duties. If Zeke is not suspended, McFadden can be dropped. Will Fuller has been mentioned the last few weeks, and we finally got to see him play in Week 4 against the Titans. On his first game back from breaking his collar bone, Fuller caught 4 of 6 targets for 35 yards and 2 touchdowns. The Texans are starting to click offensively, and Fuller should start seeing more targets as he builds chemistry with potential ROY (too early?) Deshaun Watson. Fuller should be added in 12 team leagues, and may be worth a shot in 10 team PPR leagues as well. Deshaun Watson once again looked like a veteran QB, completing 25 of 34 passes for 283 yards, 4 touchdowns, and 1 interception. He added 24 rushing yards on 4 attempts and had a rushing touchdown as well. This comes after a 301 yard, 2 touchdown effort in New England where the Texans almost beat the Patriots. For teams that like to stream quarterbacks or are still waiting for the return of Andrew Luck, Watson may be more of a long term answer.